The Margolese National Heart Disorders Prize is awarded annually to a Canadian physician or scientist who makes outstanding contributions to the treatment, amelioration, or cure of heart disorders. The prize is awarded with the expectation that the recipient will continue to make outstanding contributions in the future. Among the criteria that will be considered is impact on policy and practice, forging partnerships with scientists and others to foster heart disorders research and/or to implement discoveries, and cultivating future leaders in the field. For the first year in its eight-year history, the Margolese National Heart Disorders Prize is being shared by two recipients: Andrew Krahn, the Head of the UBC Division of Cardiology, for his work on detecting and managing heart rhythm disorders, and Bruce McManus, a Professor of Pathology and Laboratory Medicine, who has parlayed his insights into inflammatory heart and vascular diseases and transplant vascular disease into the development of diagnostic or predictor biomarkers for heart, lung and kidney failure. Andrew Krahn, the Paul Brunes Chair in Heart Rhythm Disorders, has established himself as one of the world’s premier authorities on inherited arrhythmia, particularly the most severe, potentially fatal forms. In addition to revealing the specific genetic basis for several congenital arrhythmias, he has helped to refine clinical management of these conditions and has spearheaded efforts to screen for these conditions among high-risk individuals to prevent sudden death. Dr. Krahn collaborates with life scientists to understand the role of genetic variants associated with several forms of inherited arrhythmia, with a focus on methods for diagnosing these conditions, understanding their genetic basis, and linking them to treatment strategies. He started a national registry of people with these variants, encompassing 17 sites, to enable more robust research, and the resulting national network integrates researchers with health care providers, patients and families in setting the research agenda, with a goal to improve care of these patients and their families. He has led ground-breaking studies in the causes of syncope (fainting), often resulting from arrhythmia, that led to a leadership role in global practice guidelines. He helped to develop a miniature implanted heart monitor, the implantable loop recorder, that has become a crucial tool for managing the condition. 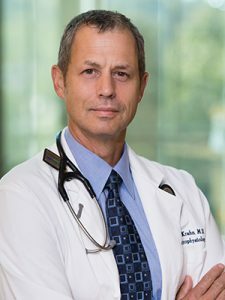 Dr. Krahn has also worked on improving the safety and reliability of implanted heart rhythm devices, such as pacemakers and defibrillators, and founded the Canadian Heart Rhythm Society Device Committee. Join us in congratulating Dr. Krahn on this remarkable achievement.